As of 4/8/19, I have not re-opened the ordering buttons because of some complications. 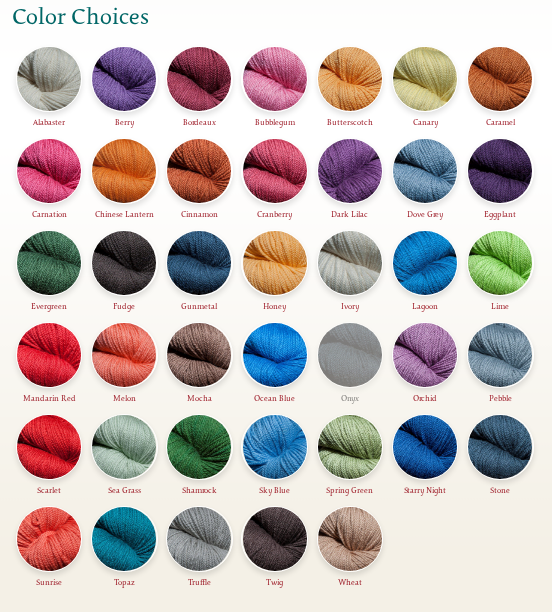 the yarn IS available, just email me and let me know what you want. Apologies for the inconvenience. JaggerSpun Green line is 100% Organic... "Our certified 100% Organic Wool yarn is spun at our mill in Springvale, ME and organically dyed at our dyehouse in New England. With 36 shades to choose from, we feel there is something to please everyone. Naturally; it's JaggerSpun"
It is a luxury yarn at an affordable price. • 100% Organic Merino wool, fine grade. These yarns are sold on one pound cones (a little less than half a kilo). The Green Line organic yarns are $41.20/lb: to be adusted). If you want to pay by check or money order, please email us and we'll send you the total to be sent. If you want more than 1 cone of yarn, you can email us for an invoice for more accurate shipping.